A small but significant victory was achieved in suburban Philadelphia this week when the Montgomery County Bar Association confirmed that "imam" Iftekhar Hussain, previously invited to address an ecumenical service would not be attending after all. Hussain is chairperson of the Council on American-Islamic Relations (CAIR) PA Board of Directors and a member of the CAIR PA Philadelphia Chapter Executive Committee. Precisely whose idea it was to invite a local CAIR spokesperson to this convocation of lawyers and law enforcement officials is still unclear. What is manifestly apparent, however, is that CAIR would never have made the short list if the organizers had spent just a bit of time researching the matter. And the episode proves the effectiveness of focused community activism in denying legitimacy to Islamists. CAIR-PA Chairman Iftekhar Hussain (C) presents an award to Muzzammil Hassan (L), who was later convicted of beheading his wife. Also, CAIR National Chairman Parvez Ahmed (R). In 2007, CAIR was named as an unindicted co-conspirator in America's largest and most successful terror funding trial, U.S. v. Holy Land Foundation. In 2009, U.S. District Court Judge Jorge Solis found that the federal government had presented "ample evidence to establish the association" of CAIR with Hamas, the Palestinian terror group. The FBI cut off outreach activities with CAIR in the wake of the verdict and has repeatedly reaffirmed its ban about working with the group (see here, here and here). In 2011, President Obama signed a 2012 budget bill prohibiting the FBI from having "any formal non-investigative cooperation with unindicted co-conspirators in terrorism cases" (i.e. CAIR). This past February, Attorney General Eric Holder testified before Congress that he had refused to attend certain meetings knowing that CAIR officials would be present. The Pennsylvania branch of CAIR with which Mr. Hussain has been associated has a deeply troubling history with regard to freedom of expression, urging censorship of a documentary about radical Islam, launching an attack on schools and libraries considering books on Islam from the Philadelphia-based Foreign Policy Research Institute, strong-arming a local Internet newspaper into suspending a writer critical of it, and most alarmingly, colluding with the Pennsylvania Human Relations Commission to manufacture data about alleged Islamophobic "bias incidents" in the state and chill free speech. 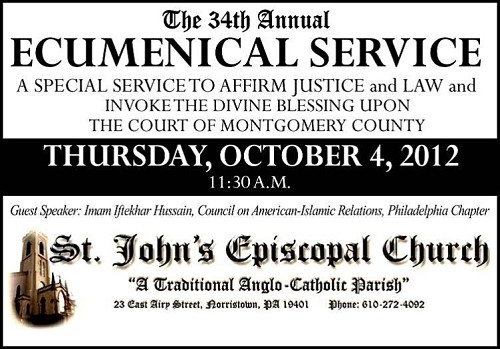 Hussain himself is also an odd choice both for an ecumenical service and for one that, in the words of the event's host, St. John's Church of Norristown, seeks to "affirm justice and law." On his blog, Iftekhar Hussain's Thoughts, he admiringly posts articles spreading lies about Israel and decrying its response to Hamas missile barrages aimed at its citizens as "barbaric attack[s]" and "massacre[s]". For good measure, he posts about the "horrors … committed by U.S. troops on innocent Iraqi civilians" and, as can be expected, characterizes criticism of violent Islam as "hate" speech and manifestations of "Islamophobia." Hussain was also involved with, and raised funds, for former congressman Joe Sestak, who in turn helped burnish the terror-linked groups credentials by speaking at the group's 2007 fundraising dinner. There are two clear and closely linked morals to this story. The first is the importance of conducting due diligence when engaging in well-intentioned outreach activities. Just because CAIR trumpets itself as a civil rights organization doesn't mean its claims should be taken at face-value. As Daniel Pipes asked back in 2006, "How long will it be until the establishment finally recognizes CAIR for what it is and denies it mainstream legitimacy?" The second equally significant lesson is the importance of focused community activism in combating this kind of uninformed behavior. 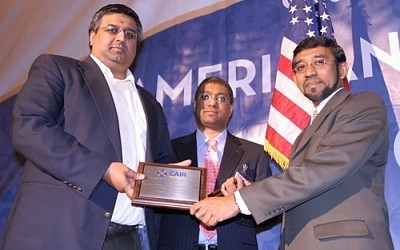 Once the invitation became known, an informal group of lawyers, law enforcement members and the Middle East Forum's Islamist Watch persistently contacted the MBA's president, presenting him with pertinent information about CAIR and Hussain and demanding that such a tainted official be disinvited. While there has been no official statement to the effect, it seems likely that this pressure led to the change. The problem is not asking an imam to deliver an address at an ecumenical service. The American Muslim community deserves a place at that particular table as much as any other faith community. The issue is, rather, who will be the true voice of tolerance and religious conviction. CAIR has failed that test time and again. It's about time that all of its cheerleaders in the media and the government face the facts and find a fitting substitute.